There was a time that I didn’t have much of an opinion on paying for college with student loans. That was before the advent of e-mail and thousands of messages all with a similar subject line: Help! I’m drowning in student loan debt! That was before I learned that 85 percent of all college graduates do not end up working in their major. That was before I heard from Jim P., who took all the student loans he could get to pay for college and law school. He assumed he’d land a big-bucks cushy job and pay back $200,000 really fast. The fifth time he failed the bar exam he gave up on being a lawyer. But the debt goes on. That was before I met Peter K., who became a chiropractor on borrowed funds. Guess what? He couldn’t stand the profession. Now he’s teaching high school math. Too bad teachers don’t make enough money to service $160,000 in student debt. But the debt goes on. That was before I heard from the couple in Nebraska who between them have $60,000 in student loans. They were going to be teachers. Then the baby came along and the teaching position didn’t. It’s all they can do to keep food on the table now that the family has grown to five. They’ve exhausted all their deferment and forbearance options. Their monthly payment is twice the house payment. The stress has all but blown that family apart. But the debt goes on … and so could I, but I think you get the point. Here’s the problem with student loans: Life doesn’t always turn out the way we plan. Stuff happens, minds change, life takes unexpected turns. But student debt goes on and on and on. It’s not as if student loans and big credit card balances are mandatory graduation requirements. You don’t have to borrow your way through college. It is possible to graduate debt-free, but it does take a lot of work. And you’ll have to buck a financial system that encourages students to take the easy way out by diving into a lifetime of debt. The secret to graduating debt-free is to use every strategy imaginable to get the price as low as possible so you can pay as you go. Take AP classes. Take all the advanced placement classes you can in high school to help knock down college tuition costs. Plan it right and you can enter college as a debt-free sophomore with one year paid in full. Community colleges. There are excellent two-year colleges in every area of the country. Lower-division prerequisite courses can be taken at the community college level at cheap tuition rates, then transferred to the college or university of choice for the third and fourth years. That means two more years to save up for the more expensive finish. State colleges and universities. Most four-year state schools offer an excellent affordable education. Our older son graduated from a prestigious California state university. He lived at home and graduated debt-free. Work for the school. Many colleges give discounted or free tuition to employees’ family members. There are lots of non-teaching jobs on a big campus. Grants. A grant is a flat-out gift and there is no requirement to repay. The most common is the Pell Grant, money from the federal government to assist low-income undergraduates. Learn more at www.finaid.com. Work-study programs. Under a federal program, work-study provides on-campus jobs for students. 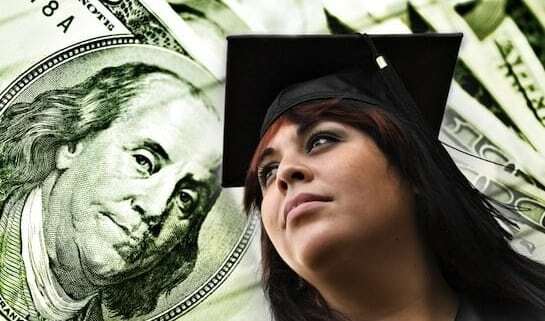 There is no requirement to repay the money even if the student does not graduate. Military. An excellent education is often a benefit for students willing to enlist. For example, the military will put you through medical school if you enter as an officer and agree to stay for a period of time upon completing your residency. Apply for scholarships. All kinds of scholarships go un-awarded every year. Many are not based on need but rather ability, even ethnic heritage. But don’t get suckered into paying a service $800 or more to do what you can do yourself: search! As a general rule of thumb, if a scholarship or a scholarship-search service asks you for money upfront, it’s probably a scam. Question: Got student debt? 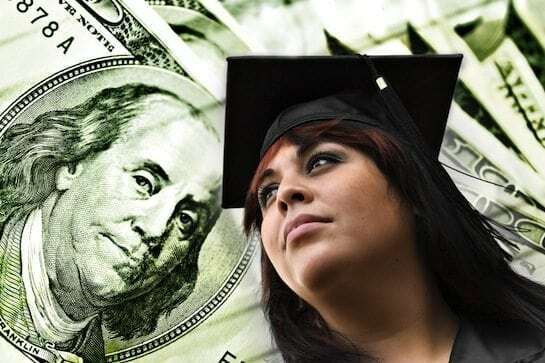 Now that you’re on this side of your education, do you have any advice for students and parents who have not yet made life-long decisions on how to pay for college?